12-digit calculator prints 3.7 lines per second in two colors with positive numbers in black and negative numbers in red. 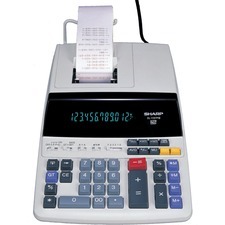 Functions include cost-sell-margin; profit margin; quick tax calculation; calendar/clock on display; grand total; decimal positions in add, 0, 2, 3, 4, 6, floating; nonadd print; round-up/off/down; item count; sign change, grand total; and oversized plus, minus and total keys. Calculator runs on AC power and weighs 3.9 lb. 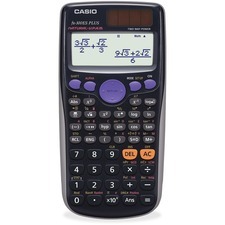 Advanced scientific calculator features Natural Textbook Display and improved math functionality. Calculator is designed to be the perfect choice for high school and college students learning general math, trigonometry, statistics, algebra I and II, pre-algebra, geometry and physics. Protective hard case keeps the calculator from being damaged while traveling. Calculator is solar-powered and features a battery backup supply. Financial Calculator for Dummies is perfect for everyday people looking to take charge of their personal finances. The keys are clearly labeled with words, not abbreviations, and are color-coded for easy use. Complicated and rarely used financial functions are left out. 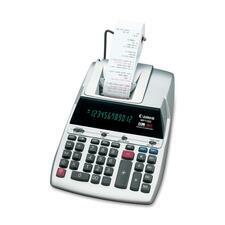 Functions include calculating monthly payments, calculating interest rates, determining principal amounts and more. Calculator is designed to help you understand your credit card debt, calculate loan payments, plan for college costs and set retirement and savings goals. The large, 10-digit display is easy to read with extra-large digits (13mm) and includes a booklet with everyday examples in plain English. 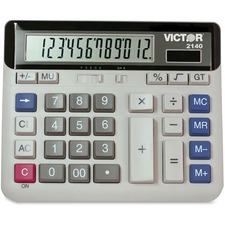 Battery-powered calculator also features plastic keys and runs on a CR2025 battery. 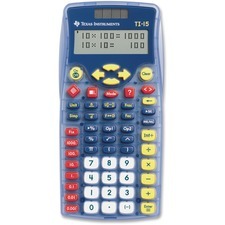 TI-15 Explorer Elementary Calculator encourages students in grades third through sixth to develop their problem-solving skills and begin connecting mathematic concepts. Displaying two forms of fractional results simultaneously allows students to begin making crucial mathematic connections. They can simplify fractions to lowest terms automatically or step by step. Calculator converts improper fractions, fractions, mixed numbers, decimals and percent and perform operations in M-D-A-S order. Built-in flash cards challenge their addition, subtraction, multiplication and division skills. Set the flash cards for the appropriate age and type of operation. The flash card functionality gives students hints when a wrong answer is entered and includes an internal scoreboard enabling teachers to check each student's progress. Design includes an impact-resistant cover; hard plastic color-coded keys; two-line display with 11 digits per line and dual power source (battery and solar). 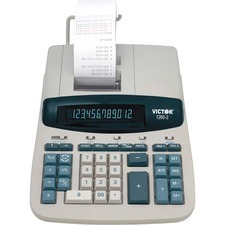 Heavy-Duty Print/Display Calculator features Microban protection, a large blue fluorescent 12-digit display with punctuation and two-color printer ribbon. Print 4.5 lines per second. Microban antibacterial protection inhibits growth of bacteria, mold, mildew and fungus that leads to product deterioration. Functions include four-key memory, clock/calendar, markup/profit margin, floating or fixed decimal (6, 3, 2, 1, 0), add mode, constant modes, item count, conversion/average/time calculation, and a grand total key for quick, efficient calculations. Calculator runs on AC power. Heavy-duty calculator prints 4.6 lines per second in two colors. Design features an extra-large 12-digit fluorescent display and built-in metal paper holder. Cost-sell-margin keys allow you to quickly and easily solve cost-sell-margin problems by entering two variables, and the third appears and prints. 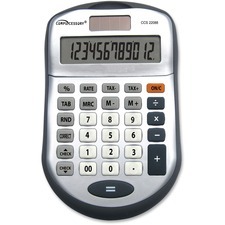 Other functions include time/date feature, two independent tax keys, four-key memory, Sigma, percent, delta percent of change, backspace key, grand total, automatic constants, change sign key and item count with averaging. Calculator runs on AC power and weighs 3.5 lb. 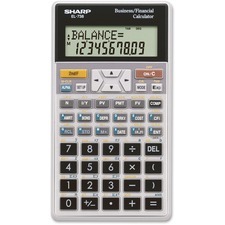 A powerful desktop calculator with a 12-digit LCD that offers reliable performance. Use the 120-step check and correct function to review your calculations through up to 120 steps and make any necessary corrections. Rubber keypad is color-coded and easy to use for extended periods of time. Four-function memory is great for tedious calculations, such as square roots or long division. Using both solar and battery power, this calculator will work anywhere you are. Desktop calculator also features percentage key, decimal key and rounding key. 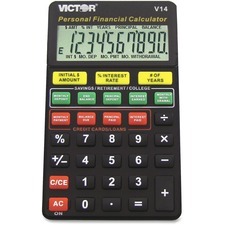 This 10-digit financial calculator computes all time-value-of-money calculations. Large, 10-digit, liquid crystal display (LCD) features two lines and mode indicators. Functions include amortization calculations and interest rate conversions, nonuniform cash flow calculations, two-variable statistics with linear regression, cost/sell/margin and markup calculations, sign change, percent and square root. Lightweight calculator weighs 3.5 oz. and includes batteries and a wallet cover with pocket.